Your next presentation audience might give your PowerPoint presentation slides much more attention than normal. That’s much more attention if you decide to make some changes to those slides. The default PowerPoint presentation slide can be miserable to look at. So, here are some guidelines to help you get more from your PowerPoint slides the next time you have to give a presentation. 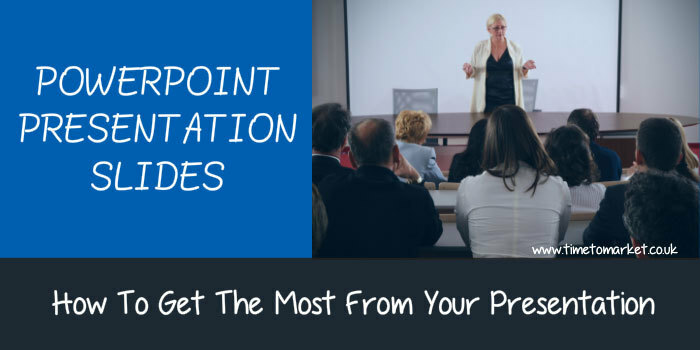 Here are five simple PowerPoint presentation slide tips to help you get the most from your next presentation. Text. Go easy on the text. When you present with PowerPoint slides, less is definitely more. So aim to use fewer words. Less text. It will be easier to read and your audience will approve. Bullet points. Bullet points and lists sap the strength of any presentation audience. Therefore, aim to use them, if you must, only to summarise key points. Use large text. A 30 point font size is readable from a distance. But if you use anything smaller, then you run the risk that your audience can’t read the words on your slides. You can also consider these presentation design tips for more ideas. Images. Use quality images in your PowerPoint presentation slides. Aim for these to be large enough to be enlarged on your projection screen. If it’s grainy on your viewer, it’s too small for your audience. Note how the Kimberly-Clark PowerPoint presentation failed to do this. Avoid the corporate template. Many businesses promote themselves with a corporate PowerPoint presentation template. Typically they don’t work. They leave you, the presenter, with too little space for your presentation. Resist them. To find out how you can prepare better PowerPoint presentation slides with a PresentPerfectTM training course you can call 01344 859823 or email: training@timetomarket.co.uk.